Oil prices fell for a third consecutive week as stock markets sold off and the market focused on a weaker demand outlook for crude. Hedge-fund and money managers are cutting their bets that oil prices will rise. U.S. crude has fallen 12 percent from a nearly four-year high at the start of the month, while Brent is down about 10.5 percent. Oil pump oil rig energy industrial machine for petroleum. U.S. West Texas Intermediate crude ended this week down 2.2 percent and has now tumbled about 12 percent from its recent high of $86.74 on Oct. 3. Brent crude, the international benchmark for oil prices, fell 2.7 percent this week and is down 10.5 percent from its Oct. 3 high of $86.74. Crude futures have gotten swept up in a wider stock market rout this month, with most of the losses for oil coinciding with a sell-off in equities. But the narrative driving oil prices has also flipped in recent weeks, and traders are closing out bullish bets on the commodity. At the start of October, oil prices were rising on signs that U.S. sanctions are shrinking Iran's crude exports faster than anticipated, potentially leaving the world with a shortage of oil. The sanctions are expected to cut crude exports from Iran, OPEC's third-biggest oil producer, by about 1 million barrels per day. "The narrative about the supply crunch with Iran got offset by this burst of supply that came on the market from OPEC and Russia and Saudi Arabia," said John Kilduff, founding partner at energy hedge fund Again Capital. "The long side of the equation has been bailing out," said Kilduff. The drop in long positions suggests that traders are shedding risk and taking profits after the recent rally, Tamar Essner, director of energy and utilities at Nasdaq Corporate Solutions, told CNBC earlier this week. 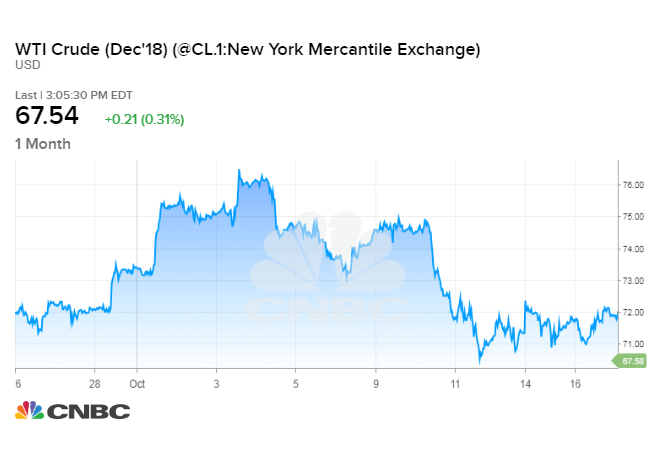 U.S. crude futures have flipped into contango, which means prices for future delivery of the commodity are more expensive than contracts to ship it at an earlier date. That makes U.S. crude less attractive for traders who make money by rolling their investments into the following month's contract. The shape of the futures curve also suggests that the oil price rally was not justified, said Michael Cohen, head of energy markets research at Barclays. When traders believe there's a shortage of oil on the horizon, they typically bid up the price of crude for delivery in the near future. That causes steeper backwardation in the futures curve, with prices for earlier delivery trading at a higher premium to the cost for future shipments. Cohen notes that Brent crude shot up to more than $86 a barrel at the start of October, but the futures curve barely budged. That was a tell-tale sign the lofty prices wouldn't last. Barclays currently sees the oil market flipping into oversupply in the first quarter of next year. The bank recently downgraded its forecast for global economic growth in 2019 to 3.8 percent, down from 4 percent, on slowing global trade volumes, a deteriorating outlook for most emerging markets and the view that growth in Europe and Japan has already peaked. Indicators of oil demand growth are underperforming while signs of supply gains are strengthening, Cohen says. However, the recent pullback in oil prices could push Saudi Arabia and Russia to adjust their current policy, he says. A group of two dozen producers led by the Saudis and Russians agreed in June to pump more oil in order to tamp down prices and keep the market supplied. On Thursday, a committee representing the group said rising global crude stockpiles and economic uncertainty could force them to reverse course. The same day, Saudi Arabia's OPEC governor said the oil market could be oversupplied by the end of the year. "Given the move down [in oil prices], the question we all have to reflect on is, are the Saudis and the Russians going to change their strategy of bringing back more oil by the end of the year?" Cohen said.